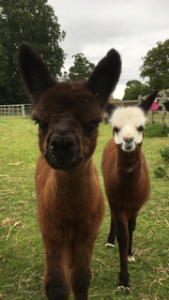 I’ve been wearing my midwife hat for the last couple of months, caring for the ante-natal and post-natal patients- my beautiful alpacas who have produced seven new cria (four females and three males). Six of the births were straightforward, but the last baby to arrive was very small and it was touch and go for a while. ‘Tiny Tim’ was finding it hard to get up and feed, so he was given artificial colostrum which saved his life. He may be small, but he’s full of life and mischief and provides us with plenty of amusement as we tend to his needs. 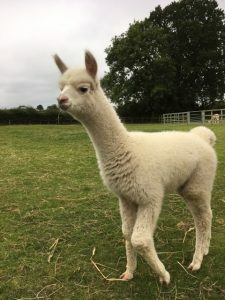 Due to unexpected circumstances we lost three Mums just after they had their cria, and we had to make a quick decision whether to hand rear the cria. It didn’t take long for me to decide that we just had to do it and so I have now become their adopted Mum! It took them a few days to adjust to their two-legged mother feeding them with strange-tasting milk from a bottle, but after some initial problems with the concept they are now doing well. My little orphans have bonded with each other and now do absolutely everything together. Three very friendly babies looking for their adopted Mum! I’ve just sent another batch of fleeces to the East Anglian mill in Norfolk to be spun into the beautiful, luxurious yarn that alpacas are so well known for. And because I’ve lost some of my own herd, I’ve sourced some wonderful fleeces from France, from people I know very well who have been breeding alpacas for a long time. Thanks to their years of experience and the introduction of top genetics into their herd, they produce top quality fleeces with a very soft handle. The shop has been running smoothly, and we’ve found needle felting a very popular activity with our customers. We’ve started to sell wonderful colourful tops, together with needle felting needles and sponges. We also have an appealing needle felted alpaca kit which is unique to Coco Alpacas. We will be running two needle felting workshops before Christmas, the first one at the end of September and the other at the beginning of December. All details will be on the events page of this website. We are also running a crochet workshop on 10th September and are planning a Nuno felting workshop for October (details to be confirmed later). Please get in touch if you are interested in coming to these events- you will receive a very warm welcome. Details of the workshops are under Events on the website.